Hi! Courtney here today! The last time we chatted here I was sharing a tour of my tiny bedroom in my sister’s townhouse, and also the announcement of my move. If you missed that post, you can catch up here. Today I’m excited to be sharing with you a tour of my very first apartment in Seattle! It’s been just about almost a month since I moved in now…wow, time is flying! I took these photos before I moved in (hence the emptiness). 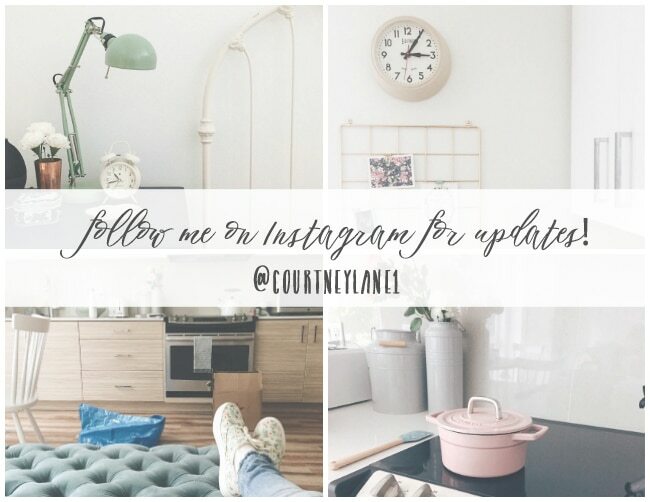 This tour will be mostly me showing you the layout of my new space, but if you’ve been following my photos and stories on Instagram, you’ve seen some sneak peeks of how it’s looking so far! *Update* Click here to take the tour of my apartment after I lived here for a year and a half! 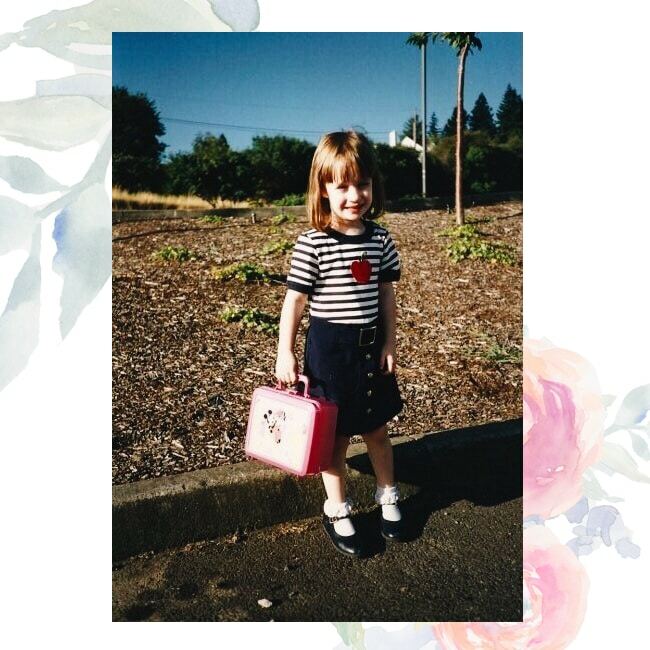 This picture actually reminds me of the picture my mom took of me on my first day of kindergarten. Both momentous occasions! Since I mentioned it, I might as well just put this right here…..
Ha! Alright, that’s enough reminiscing. That’s not what we’re here for. :) On with the tour! This is my entryway! I didn’t expect to have such a designated entry (I thought it would just enter right into the apartment), so I’m really excited about having this as a welcoming spot. Here is what you see once you walk past the entry. 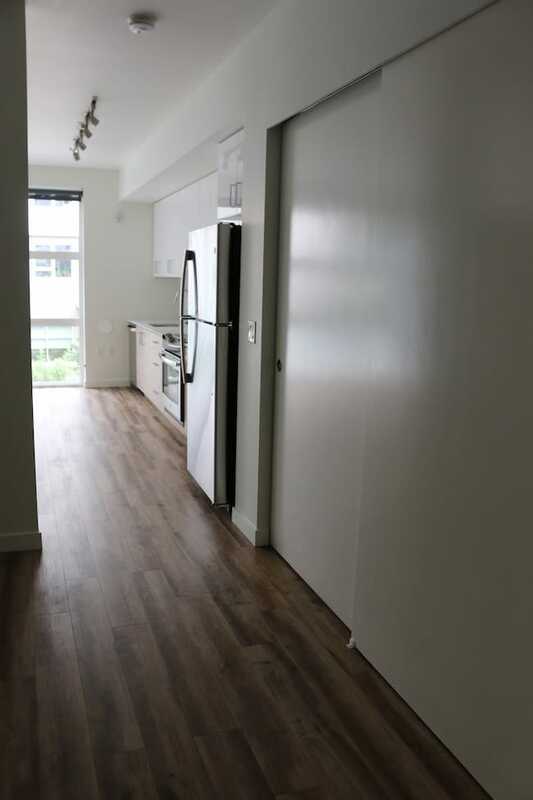 That door on the left is my bathroom, and the double louvered doors on the right are where my washer and dryer are. The opening on the left is my bedroom. 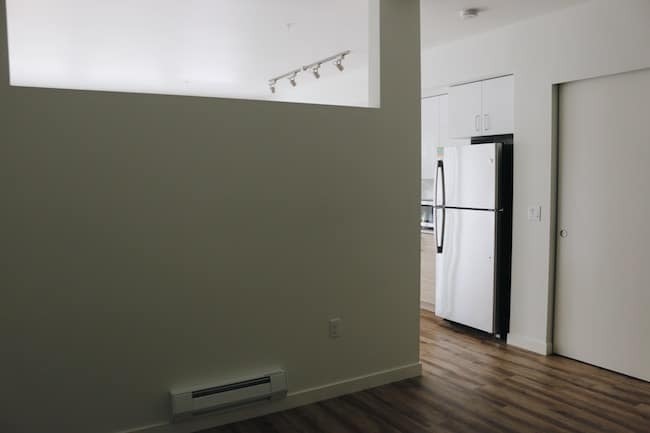 This apartment is considered an ‘open one bedroom’, so it has a separate bedroom space but without full walls. Some ‘open one bedrooms’ have sliding frosted glass doors to separate off the bedroom, but I’ve really enjoyed having it open while still being its own space. 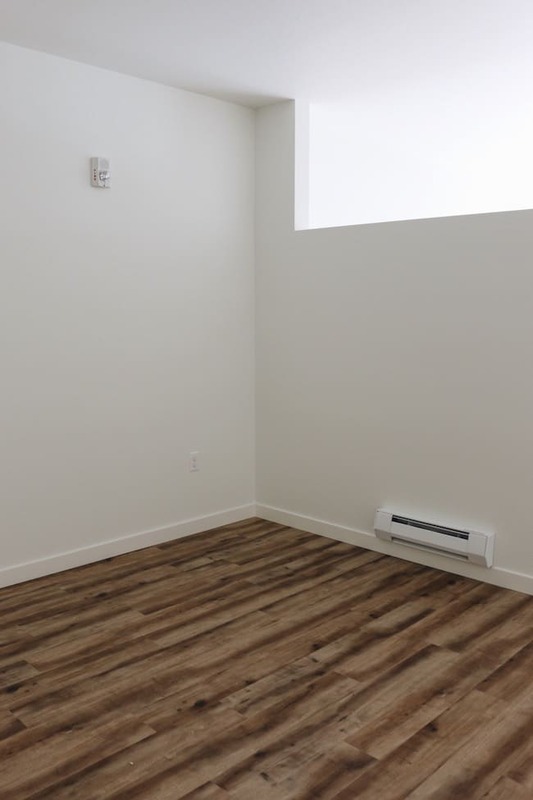 The bedroom has a cutout opening on one wall, letting tons of natural light in from the kitchen/living room. This is the wall directly across from my bed. Straight ahead is my closet. 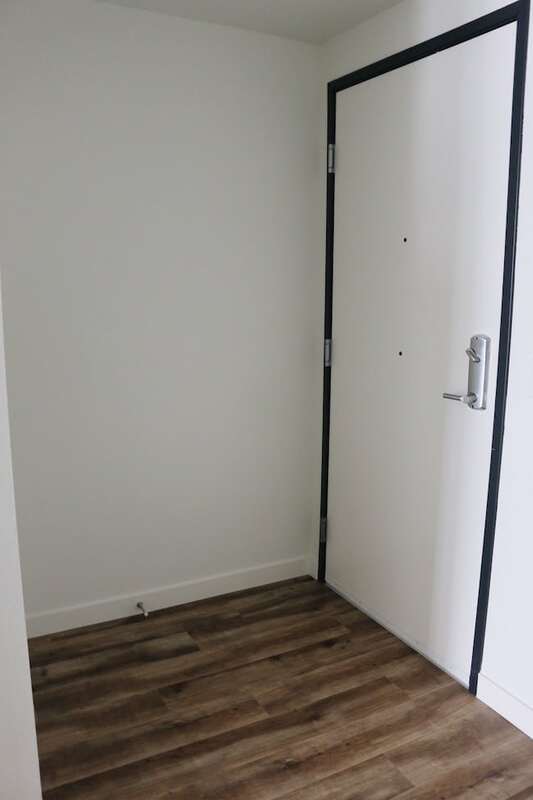 The amount of storage in this apartment has been amazing! I definitely had to get creative with my small space solutions in my last room, and it worked out pretty well. But it’s been great to be able to spread out my stuff a bit now instead of cramming everything in. I feel much more organized! This is the bathroom. 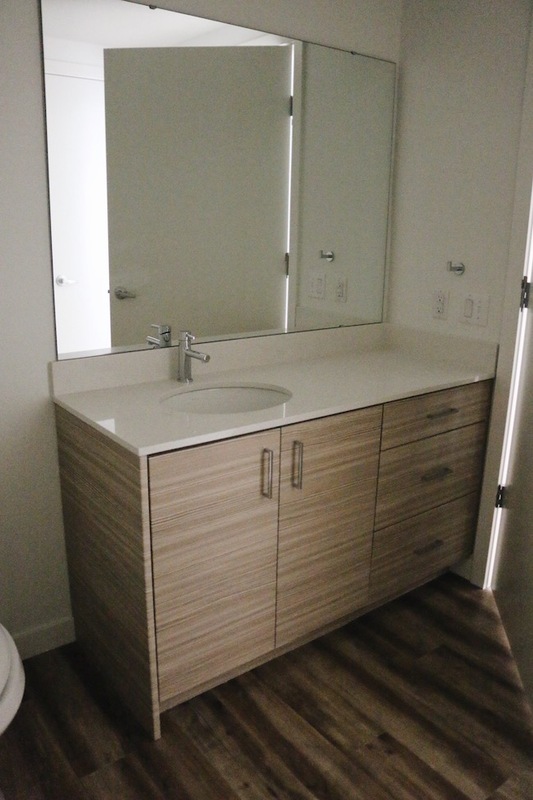 There’s a ton of storage and counter space with this vanity, and a linen closet on the opposite wall next to a shower/bath. 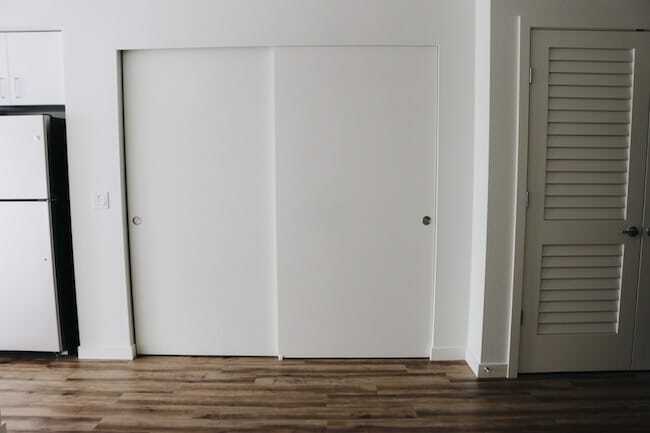 I’ve been liking that most of the storage in this apartment is concealed by doors. I do love open storage sometimes, but there’s something really nice and tidy about being able to just tuck most things out of sight. 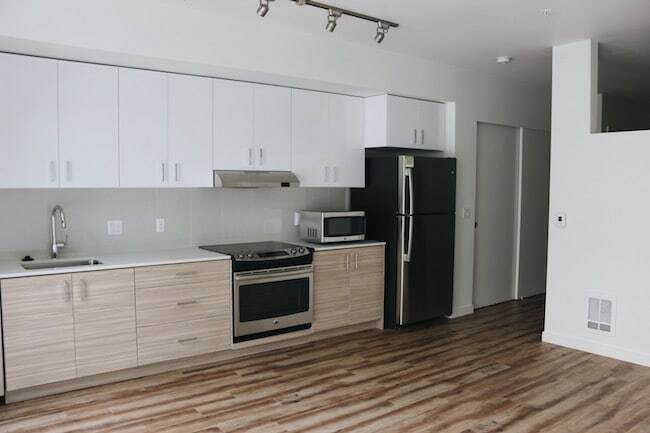 Okay, now let’s head into my favorite parts…the kitchen and living area! This is the living/kitchen/dining room. 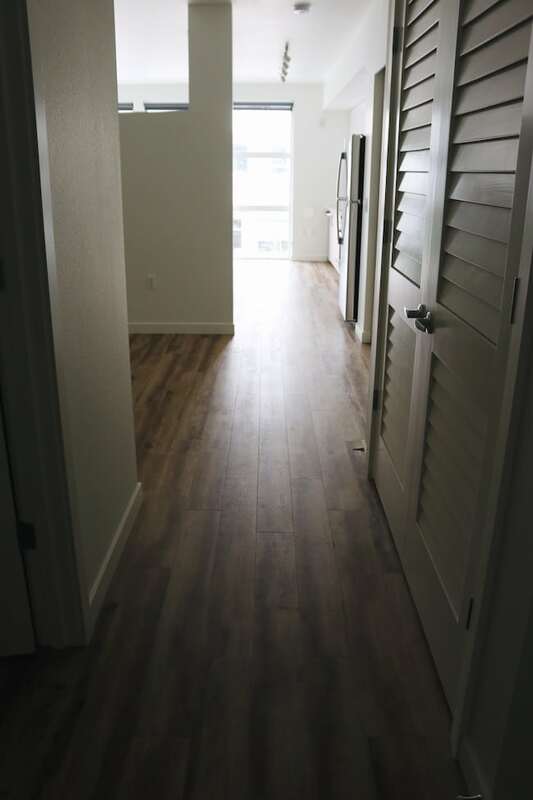 The floors are a nice grayish wood laminate (the floors are the same throughout the whole apartment). 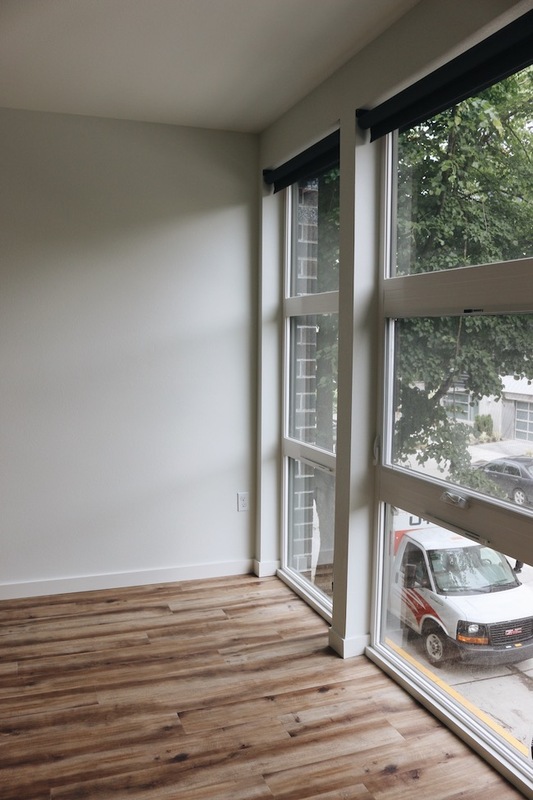 The floor to ceiling windows give this space so much natural light all day! The dark gray blinds were here when I moved in and I pull those down in the evening. I will probably add a curtain panel on either side of these windows just for softness! Here’s one picture of the kitchen a few days after I moved in. I felt at home really quickly in this apartment, even when I had no idea where my silverware or hair dryer were and there were random boxes strewn about. Let’s be honest, there still are a few boxes strewn about. But it’s getting there! I’m thinking this whole area by the windows is going to be the perfect spot for lots and lots of plants! Will I keep them alive is the question…? Here is what it looks like from the kitchen looking back toward the bedroom and entry hall. I’m so thankful for this new season of life here. As someone who has always loved design and all things home, it’s not an exaggeration to say it’s a dream come true for me to have this space. I know this is a season I’ll always remember! I’ve been having lots of fun decorating and making this apartment my home for the last month and I can’t wait to share my progress on The Inspired Room! Stay tuned. In the meantime, feel free to come follow me on Instagram where I often share homey photos and Insta stories! Thanks for stopping by my first place, friends! For some reason, I’m not getting your blog emailed to me any longer. You may want to looked into that. 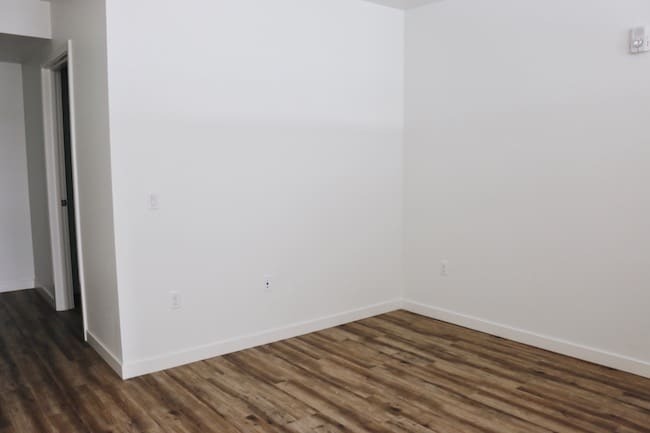 This is such a great apartment Courtney! Those windows are wonderful! 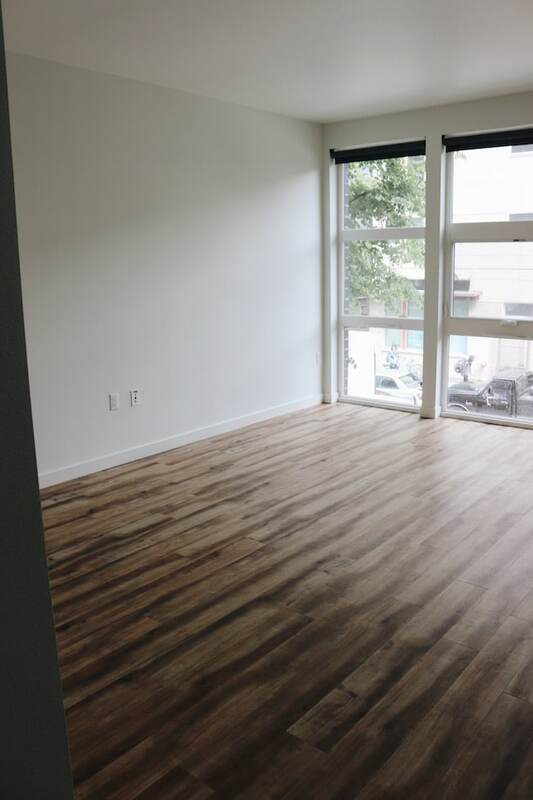 I know you’ll enjoy this space and I can’t wait to see how you’ve decorated it! Woops in the wrong log in, that was from me, Courtney :) Haha! Love it, thanks for sharing. You can always add a roller island in your kitchen for more counter/prep space too! This reminds me of the first apartment I had many years ago. I won’t say how many years, but I’ll give a hint: my rent was 120.00 per month. Ha! I know you’ll have so much fun getting everything put together. Just one word of caution: have you checked the blinds from outside to be sure they’re giving privacy? I was kind of shocked to find out some that I had were pretty much invisible at night! Hi Peggy! $120 a month sounds GREAT! Hahah. Thank you for the tip on checking the blinds privacy :) I keep meaning to have someone actually go outside to observe the privacy. Up til now I’ve just been assuming they’re completely NOT private and being careful haha, but I’m thinking an extra layer of curtains will be helpful too!! 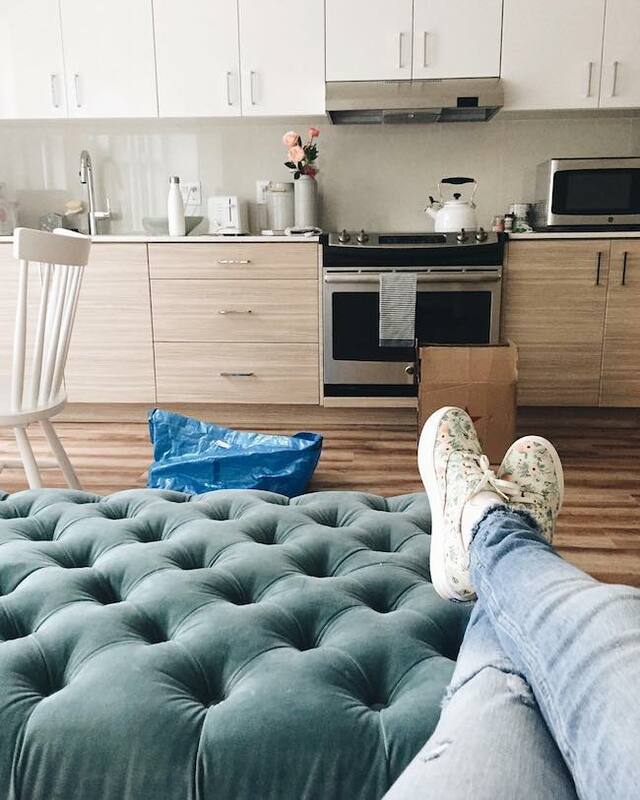 I love seeing how you decorate the apartment on your stories, keep them coming! Your inspire me to get working on my place haha. Thanks for sharing the “before” photos! 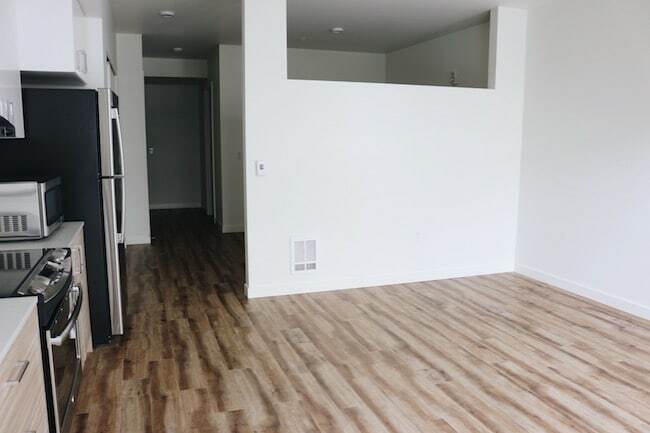 Your apartment looks like a house compared to the size of my first apartment! Look forward to seeing you decorate it, and I know you will enjoy it all! Thank you so much! Kathy!! Yes, I was so thankful for how much unexpected space there was in here! 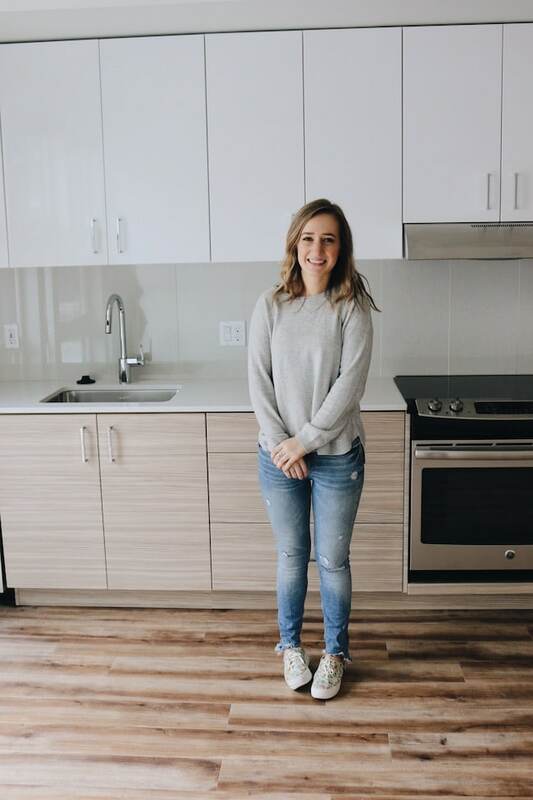 What a great space, Courtney! I can’t wait to see the finished product! If you have even half your mother’s decorating talent it will no doubt be fabulous!! 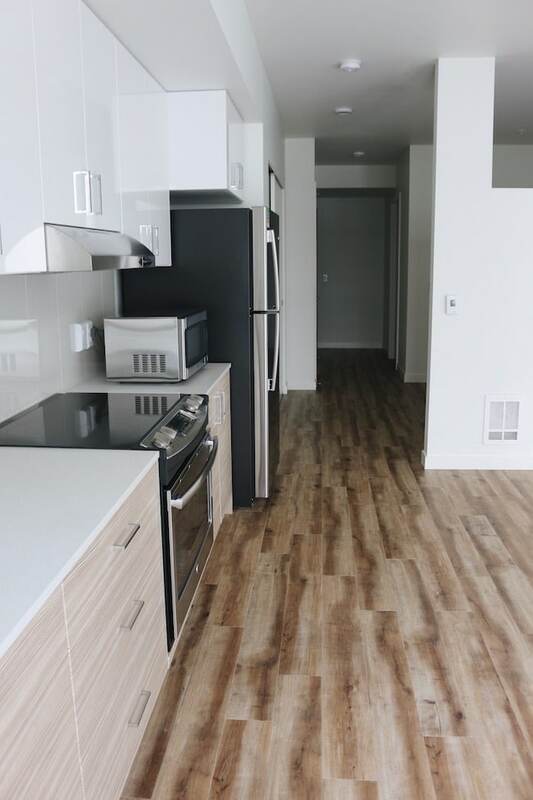 Such a cute apartment! Did you steal your mom’s tufted ottoman or did you buy one too? I love that thing. I stole it :) Haha. For now, unless she finds the perfect spot at her house for it! Thank you!! First off, congratulatiins on your first place! 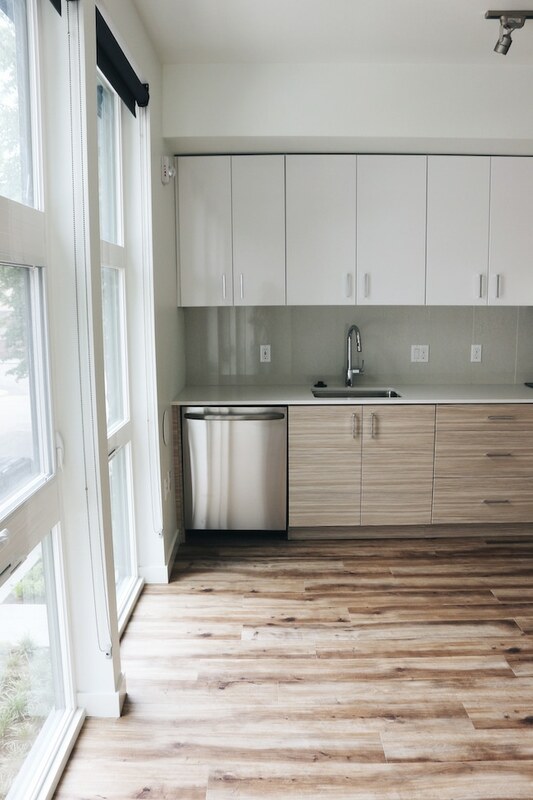 😍 How exciting and what a beautiful place it is…flooded with natural light, sleek, modern, NEW and a great blank canvas for you to put your creative design talents to use making it HOME. I am looking forwarded to see what you do. Blessings! Courtney, the apartment is darling! When you asked if you’d be able to keep the plants alive, I started singing in my head… “Stayin’ alive! Stayin’ alive! ah, ha, ha, ha…” I think the laundry room is such a bonus – I see tons of potential storage space in there! Can’t wait to see what you do with your new pad. Thank you so much Angelika! (delayed response here, haha). Can’t wait to share updates this month on the blog!! I love, love, love all the white! The beige apts for the last 50 years have to go! Also love hard floors vs carpeting. Nice kitchen. Nice place. I’ve not seen anything that nice here in Milwaukee. Thank you Linda!! I love the white too. So light and bright and easy to personalize! Such a great place Courtney! Can’t wait to see how you decorate it. Welcome to your new home! I love your new apartment and I know it will be beautiful when you get settled. I actually like the open bedroom concept – so much more modern. 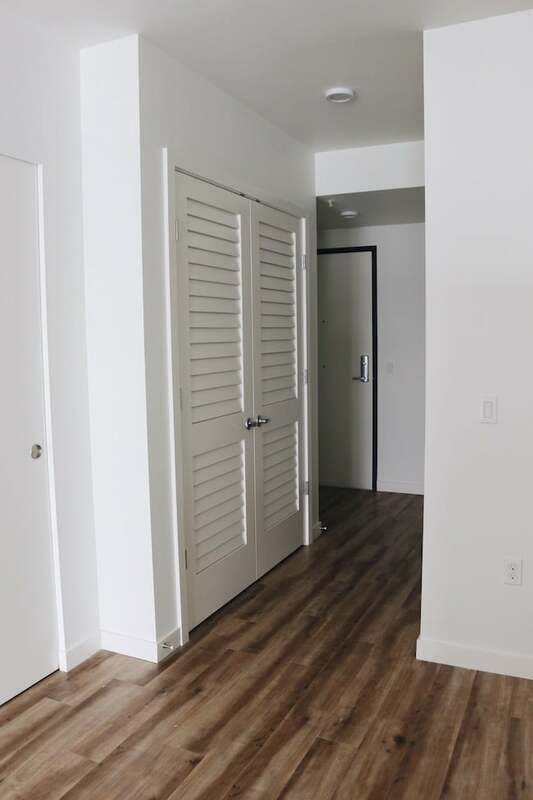 They could have done a better job with the closet doors across from your bedroom since they are front and center, but otherwise, it’s wonderful. I’m a 75 year old lady, living my myself, and I could move to an apartment like this in a minute! Good luck to you, sweetie. I’ve enjoyed living here so much! I do agree about the closet doors :) Thank you so much for the kind comment! I’m looking forward to sharing an update this month on the blog! So excited for you!! I’ve never lived alone but watched my daughters get this experience. I got married too young😜 I wish you lots of fun times and can’t wait to watch you decorate! Thank you Gail! I’m definitely enjoying this time! :) Can’t wait to continue sharing! Wow! You landed in high cotton! 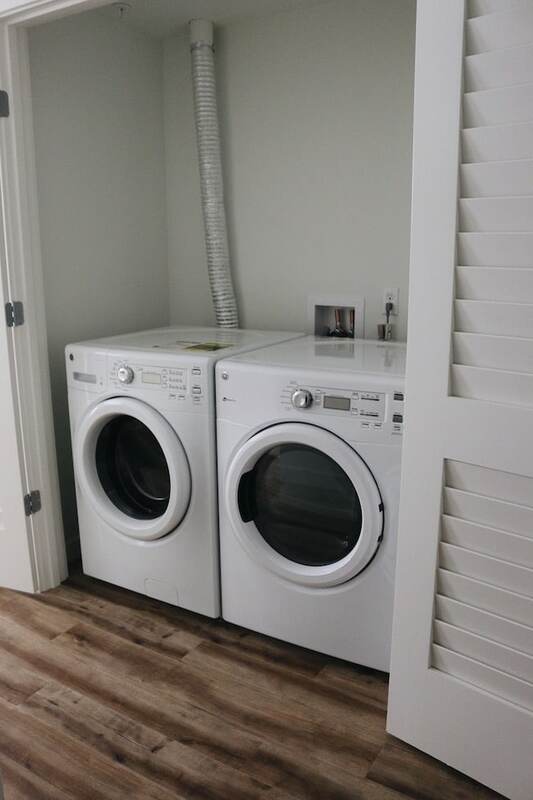 An actual entryway…..a side by side washer and dryer (and quite new to boot! )…..a separate bedroom…..a nice bathroom……a really nice kitchen……and those windows! That beautiful floor! I love the cutout on the bedroom wall! Enjoy feathering your nest! Wishing you many joys and blessings in your new home! Haha! :) Thanks so much!! I’ll be sharing an update on the blog in the next couple weeks, can’t wait!! Congratulations! It looks really nice. I have to admit, my mom senses worry about those windows and your privacy, though. ;). Much nicer than my first plac, which did not have a semi-separate bedroom. Mine also had harvest gold appliances! Your Appliances seem very nice, though. And modern. Thanks for sharing it with us. I can’t wait to see how you decorate it! Thank you Susie! Yes, I’m thinking some curtains on the side will be nice to add for some extra privacy. Until then I’m just being careful :) I can’t wait to share updates this month!